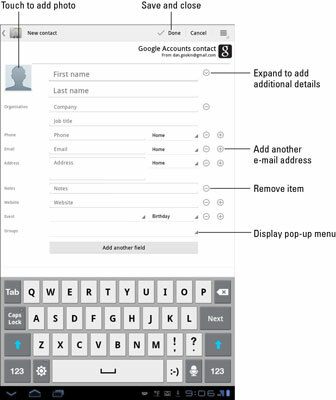 You can create a brand new contact from scratch in your Samsung Galaxy Tab using the Contacts app. To start the Contacts app: Touch the Apps Menu icon button on the Home screen; then touch the Contacts app icon. Touch the New Contact button. Fill in the text fields with the information you know. Use the chevron (down-arrow) button to expand an area to see more details. To add fields, touch the Plus button; touch the Minus button to remove a field. Touch the Done button to complete editing and add the new contact. The new contact is automatically synched with your Google account. That’s one beauty of the Android operating system used by the Galaxy Tab: You have no need to duplicate your efforts; contacts you create on the Tab are instantly updated with your Google account on the Internet. Use the chevron (down-arrow) buttons when you don’t see enough fields to add information required for a contact. Touching the triangle buttons displays pop-up menus from which you can choose various options, such as setting whether a phone number or an e-mail address is Home, Business, or what have you. Information from social networking sites is stirred into the Contacts list automatically, though sometimes the process creates duplicate entries.